It turns out what is happening here is you take bow hair and tie it to the G string of the violin about a centimeter awawy from the bridge towards the fingerboard (I used a reef knot "left over right and under, right over left and under" and in the recording below I didn't tie it tight to the string, but I don't think it matters either way). I used this effect in my piece Piosenki. Unfortunately I only exploited its cruder qualities, using it in the opening of the song 'Smelly' (it evokes flatulent imagery). You can hear it on the Carnegie Hall website where it is the forth song, about 5 mins in. and here's how it sounds.. I was visiting my inlaws in Poland over Christmas and the plan was to punch holes in the lager tops we'd collected with a help from the metal worker who lived next door (Romek). Now Romek was very enthused by the whole project and promptly found us a huge bucket full of metal discs that were left overs from bird cages he makes. We punched holes in about 500 of them with his drill - 5 at a time, so took about an hour. Cleverest of all, this may be the world's first portable lagerphone - we used three shovel handles and cut the head of a large screw, so each part screws together like a long curtain pole. The portability was a requirement because a) I had to get it back from Poland and b) I have to take it with me to the states in April, where it will feature in the last of my Piosenki. Incidentally, research I did into the lagerphone recently suggested a whole army of other names for it, and indeed it's ancestory, or at least related instrument in the Turkish 'Jingling Johnny' or Turkish Crescent, where it was used to scare the living daylights out of the invading Westerners. Oh, and amongst others, Haydn used one in his Military Symphony (though I guess his didn't have a boot). 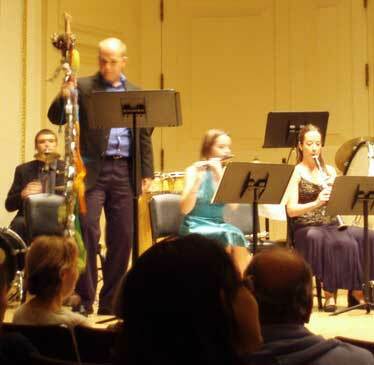 My lagerphone has now had its premiere in Carnegie Hall! Here's a shot of baritone Yang Yang holding it after the premiere of my piece Piosenki. My daughter helped decorate it further with some colourful tassles which danced and waived delightfully during the performance. You can hear the full recording of the first Carnegie performance on the Carnegie Hall website - the lagerphone is featured in the very last song, about 18mins in. As this page is visited regularly by people interested in the lagerphone, I thought I should add something about the inspiration to build the lagerphone. During the Carnegie workshops for my piece Piosenki I met Hyper-Accordionist and one half of the Groanbox Boys Michael Ward-Bergeman. Somehow we got talking about his lagerphone which is used in the Groanbox Boys duo, and I knew I had to make one. Visit their page dedicated to 'the boot' on the Groanbox Boys Freedom Boot page. I am now thrilled that I have passed this inspiration on to my friend Clive Batkin who is planning to build his own 'heavy metal lagerphone'! Piosenki has now been taken up by world-famous soprano Dawn Upshaw, who has performed it in Minneapolis and at Carnegie Hall. Here's the latest picture, together with Baritone Evan Hughes and the composer.